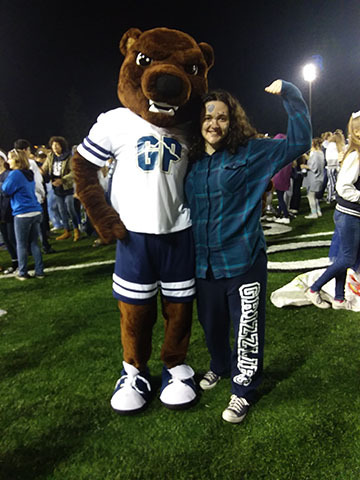 Student poses with the mascot at the homecoming game. This football season, some may have noticed a big bear mascot taking pictures and engaging with little kids at the games and down on the track with the cheerleaders during games to motivate the crowd to cheer. Ms. Zanol,the cheer coach, is in charge of the mascot. “There’s no official name for it, I just call it Grizz,” Zanol said. 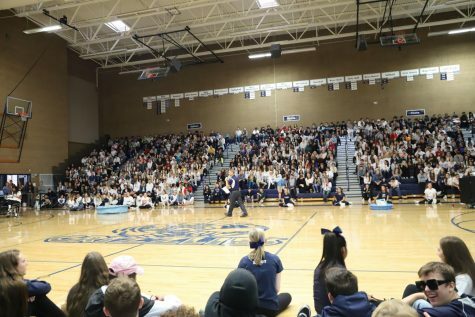 Glacier Peak has had a mascot costume since its second year as a school, and this year the school got a new costume, and people can volunteer to be the mascot during games. “It can be hard to find the right person,” Zanol said. Height is an issue to those looking to be the mascot; it only fits people who are up 5’ 10”. There are also some guidelines; you can’t talk, and you have to be okay in confined spaces and interacting with people. Kids come up to talk to the mascot costume, and the mascot can’t scare them. Movements must be big to make an impact on the crowd and, of course, school appropriate as well as no fighting the other team. “Fighting doesn’t send the message doesn’t send the message of school spirit that we want,” Zanol said. Usually Ms. Zanol wants a mascot during games like the homecoming football game, or if the basketball teams go to the Tacoma Dome or any state competition. “We want our school to be represented in every way we can,” Zanol said. Basketball games are tough for the person in the mascot costume; the gym gets really hot during the game and the costume heats up quickly. The new costume has a fan in it, though it hasn’t been used yet, and there are even ice vests that they could wear.